Neuroblastoma is one of the most common solid tumors of childhood, arising from immature sympathetic nervous system cells. The clinical course of patients with neuroblastoma is highly variable, ranging from spontaneous regression to widespread metastatic disease. Although the outcome for children with cancer has improved considerably during the past decades, the prognosis of children with aggressive neuroblastoma remains dismal. The clinical heterogeneity of neuroblastoma mirrors the biological and genetic heterogeneity of these tumors. Ploidy and MYCN amplification have been used as genetic markers for risk stratification and therapeutic decision making, and, more recently, gene expression profiling and genome-wide DNA copy number analysis have come into the picture as sensitive and specific tools for assessing prognosis. The applica tion of new genetic tools also led to the discovery of an important familial neuroblastoma cancer gene, ALK, which is mutated in approximately 8% of sporadic tumors, and genome-wide association studies have unveiled loci with risk alleles for neuroblastoma development. For some of the genomic regions that are deleted in some neuroblastomas, on 1p, 3p and 11q, candidate tumor suppressor genes have been identified. In addition, evidence has emerged for the contribution of epigenetic disturbances in neuroblastoma oncogenesis. As in other cancer entities, altered microRNA expression is also being recognized as an important player in neuroblastoma. The recent successes in unraveling the genetic basis of neuroblastoma are now opening opportunities for development of targeted therapies. Neuroblastoma (NB) is the most common extra-cranial solid tumor of childhood. It has an incidence of 1 to 5 per million children per year and it is responsible for approximately 15% of all childhood cancer mortality. NBs originate from immature sympathetic nervous system cells, the so-called neuroblasts. Most NBs (90%) are diagnosed before the age of 5 years, and the median age of occurrence is approximately 22 months . The vast majority of tumors arise sporadically, although some familial cases are described. Most of the tumors are found in the abdomen (65%), often in the adrenal medulla, or elsewhere in the human body where sympathetic nervous system components are present . NBs belong to the subgroup of small round blue cell tumors and can often pose a challenge to the pathologist because of their similarities with lymphomas, rhabdomyosarcomas, the Ewing family of tumors and desmoplastic round cell tumors. NB tumors are divided into different stages according to the localization and extension of the primary tumor and the absence or presence of distant metastases. The International Neuroblastoma Risk Grouping Staging System takes into account the extent of disease at diagnosis as well as risk factors and stages defined using imaging to classify NBs from patients from all over the world in a uniform manner [3, 4]. Metastatic tumors (stage M) have a dismal prognosis, whereas patients with locoregional tumors (L1 and L2) usually have an excellent outcome. Stage Ms tumors (where 's' stands for special and meta-static disease is confined to skin, liver and/or bone marrow) are characterized by spontaneous regression or differentiation even without any form of therapy. Although localized disease can be treated by surgery alone, the standard therapy for patients with metastatic disease usually comprises intensive induction chemotherapy, local surgery and myeloablative chemotherapy followed by autologous stem cell transplant, external radiotherapy and retinoic acid treatment. The overall survival rate for children with metastatic NB is approximately 40%, despite this intensive multimodal therapy. The survival of children with NB also correlates strongly with age at diagnosis. Children under 1 year at diagnosis usually have a favorable prognosis, whereas prognosis of older children presenting with NB is poor. Currently, there are worldwide efforts to construct a robust risk stratification system. Before any treatment, patients will be put into a risk category, according to a combination of parameters such as age (younger or older than 18 months), stage, pathology, MYCN status, other genetic aberrations such as 11q loss and ploidy [3, 4] (see below). The use of the International Neuroblastoma Risk Groups will allow international comparisons of different risk-based therapeutic approaches in the same patient population and greatly facilitate joint international collaborative studies in NB. Elucidation of the molecular pathways involved will enable researchers to stratify the disease and to adapt therapy. The clinically heterogeneous nature of NB is also reflected, in part, by its biological and genetic heterogeneity. During the past decade, several genetic aberrations have been discovered in NB primary tumors and cell lines that have been shown to correlate with the various clinical features. Moreover, genetic and molecular findings are now routinely incorporated into therapeutic decision making . Below, the most important genetic defects that have been detected in NB are briefly discussed. According to their DNA index, NBs can be divided into a group with a near-diploid nuclear DNA content (about 45% of NBs) and those with a near-triploid DNA content (about 55%). DNA index is a prognostic marker for patients younger than 2 years who have disseminated disease [2, 6–8]. It was suggested that a near-triploid DNA content, which is found more often in localized or Ms NB, was due to the fact that these tumors have a fundamental defect in mitosis leading to gains and losses of whole chromosomes, whereas locoregional or metastatic tumors with a near-diploid DNA content have a fundamental defect in genome stability leading to chromosomal rearrangements such as unbalanced translocations [2, 9]. The MYCN oncogene (located on chromosome 2p24; 'N' stands for neuroblastoma-derived) was found to be amplified in 20 to 25% of NBs, and is usually present in the form of double-minutes (chromosome fragments) or homogeneously staining regions (Figure 1) . The MYCN gene encodes a transcription factor that forms heterodimers with the MAX protein . Evidence for a direct involvement in the development of NB was obtained through the construction of a mouse NB model in which a human MYCN cDNA was placed under the control of a tyrosine hydroxylase promoter, leading to development of NB . Amplification of the MYCN gene is most often found in high-stage tumors and is a marker for poor outcome [13, 14]. A schematic overview of chromosome regions and genes known to be involved in neuroblastoma oncogenesis. This overview is not comprehensive, and only those regions and genes mentioned in the article are indicated. Gene abbreviations: ALK, anaplastic lymphoma receptor tyrosine kinase; BARD1, BRCA1 associated RING domain 1; CADM1, cell adhesion molecule 1; CDKN2A, cyclin dependent kinase inhibitor 2A; CHD5, chromodomain helicase DNA binding protein 5; KIF1B, kinesin family member 1B; MYCN, v-myc myelocytomatosis viral related oncogene, neuroblastoma derived; NME1/E2, non-metastatic cells 1, protein (NM23A) expressed in/non-metastatic cells 2, protein (NM23A) expressed in; PHOX2B, paired-like homeobox 2b; PPM1D, protein phosphatase 1D magnesium-dependent, delta isoform; RASSF1A, Ras association (RalGDS/AF-6) domain family member 1. How MYCN amplification contributes to this aggressive phenotype remains mainly unknown. Although MYCN regulates a large number of downstream genes, only a handful of key targets have yet been identified. Interestingly, high MYCN target gene expression is not restricted to MYCN-amplified NBs but is also apparent in high-stage MYCN non-amplified tumors, indicating that common pathways are altered in high-stage tumors . Deletion of the short arm of chromosome 1 has been detected in approximately 25 to 35% of primary NBs . This finding suggests the presence of one or more tumor suppressor gene(s) in this chromosome region. In the past, many attempts were made in order to delineate a shortest region of deletion (SRD) on 1p36 [17–22]. The SRD is currently defined to 1p36.31 (a region of approximately 2 Mb) [16, 20]. One of the most promising candidate NB suppressor genes in this region is CHD5 (Figure 1). This gene is a member of the chromatin remodeling family and is expressed mostly in the nervous system . The mouse Chd5 gene was found to control proliferation, senescence and apoptosis through the p19Arf-p53 pathway and was therefore validated as a mouse tumor suppressor gene . Fujita et al. found that human CHD5 expression was low in NB cell lines and in tumors harboring a chromosome 1p deletion. Moreover, they identified CHD5 promoter hypermethylation in the investigated NB cell lines and performed clonogenicity and tumorigenicity experiments. As a result, CHD5 could be defined as a valid chromosome 1p tumor suppressor gene. A second region of deletion on chromosome 1p36 was defined by a 500 kb homozygous deletion in a NB cell line (1p36.2) . Within this chromosome region, the KIF1B gene, a member of the kinesin 3 family, was identified as a haploinsufficient candidate tumor suppressor gene (Figure 1) . Deletion of chromosome 1p sequences is more common in high-stage tumors and is usually associated with MYCN amplification. The prognostic significance of 1p loss has long been controversial but current evidence suggests that allelic loss of 1p36 sequences predicts an increased risk of relapse in patients with localized tumors [28–30]. Gain of chromosome 17q is the most common genetic aberration, occurring in approximately 80% of NBs [31, 32]. It often results from unbalanced translocations with chromosome 1p or chromosome 11q [32–34], although other partner chromosomes can be involved. The involvement of chromosome 1 and chromosome 17 in the etiology of NB was further reinforced by the identification of a constitutional balanced t(1;17) translocation in a patient with NB [35–37]. The chromosome 17q breakpoints are not confined to one cytogenetic band but are scattered throughout the long arm of chromosome 17 . On the basis of these findings, the presence of one or more dosage-sensitive genes on 17q implicated in NB seems the most plausible hypothesis. Near-triploid tumors have often gained a whole extra chromosome 17, whereas unbalanced 17q gain is characteristic for near-diploid tumors. Chromosome 17q gain was found to be the strongest independent parameter for poor outcome, whereas whole-chromosome 17 gain was associated with good prognosis [39, 40]. Several genes have already been proposed as candidate dosage-sensitive oncogenes, such as NME1, NME2 and PPM1D (Figure 1) [41, 42]. Deletions of the long arm of chromosome 11 have been identified in 15 to 22% of primary NBs [28, 40, 43]. Chromosome 11q deletions are often found in high-stage tumors without MYCN amplification and with intact chromosome 1p. Chromosome 11q loss was shown to be associated with reduced time of progression-free survival [28, 44]. Recently, two common regions of deletion on the long arm of chromosome 11 were delineated and CADM1 was identified as a candidate chromosome 11q tumor suppressor gene (Figure 1) [45–47]. Chromosome 3p loss is often found in association with 11q loss and typically occurs in tumors without MYCN amplification or 1p deletion [43, 48–51]. Furthermore, tumors with 3p loss are a hallmark of NB patients with older age at diagnosis, suggesting that 3p loss is a late event in NB oncogenesis . At present, three common regions of deletions on the short arm of chromosome 3 can be delineated . Two of these SRDs were found to coincide with SRDs defined in more common cancers, such as breast and lung cancer . These regions contain several candidate tumor suppressor genes, including the RASSF1A gene (Figure 1). Familial forms of NB are rare, accounting for only 1% of all cases [53, 54]. Analysis of the pedigree structure of the rare familial cases suggests a dominant mode of inheritance with low or incomplete penetrance. Familial NB patients are often diagnosed with multiple or multifocal tumors and at a younger age than are patients with sporadic NB, consistent with Knudson's two-hit hypothesis: familial patients already carry one genetic hit in all their cells, whereas sporadic NB patients have to accumulate two genetic hits in the somatic tissue . Loss-of-function germline mutations have been detected in the PHOX2B gene, a neurogenesis regulator gene that is mutated in congenital central hypoventilation syndrome (Figure 1) [56–58]. Recently, a whole-genome linkage scan in a panel of NB pedigrees identified a significant linkage signal at 2p23-24. Resequencing of candidate genes in this region identified germline mutations in the ALK gene (Figure 1) . Subsequently, somatic ALK mutations or amplifications were identified in about 8% of all sporadic NB tumors [59–63]. ALK is a member of the tyrosine kinase family and mutations result in constitutive activation of the gene. These findings demonstrate that germline mutations in ALK are the main cause of familial NB and that they could offer new targeted therapeutic opportunities for NB patients, in addition to those suggested by somatic mutations. Genome-wide association studies (GWASs) have shown a significant association between clinically aggressive NBs and common single nucleotide polymorphisms (SNPs) or variants at chromosome region 6p22 (Figure 1), suggesting that these variants are associated with a susceptibility to NB, especially to metastatic disease with MYCN amplification and a high probability of relapse . In a follow-up GWAS, a second susceptibility locus for the development of aggressive NB tumors was identified, the BARD1 locus at 2q35 (Figure 1) . The susceptibility for NB was linked to six SNPs located in introns 1, 3 and 4 of BARD1 . The BARD1 protein heterodimerizes with the familial breast cancer gene product BRCA1  and is essential for the tumor suppressor activity of BRCA1. Whole-genome analysis techniques such as comparative genomic hybridization (CGH) or array CGH enable the study of DNA copy number gains and losses over the entire genome in one single experiment  and have, since their introduction, been used extensively in the genomic profiling of a great variety of solid tumors . Array CGH analysis has been used to classify primary NB tumors into specific genomic subgroups and to correlate these findings with clinical outcome [68–70]. As already mentioned, two major subgroups have been identified in NB: near-triploid tumors, showing only numerical chromosome aberrations and no structural defects, and near-diploid tumors, characterized by MYCN amplification and 1p deletion or deletions in 11q and 3p [43, 48, 50, 51, 71]. Subtype 1 tumors are associated with an excellent outcome, even in older patients and metastatic tumors, whereas the subtype 2 tumors are associated with a higher frequency of relapse [69, 70, 72, 73]. Even in multivariate analysis, the genomic profile (the classification into genomic subtype) is still statistically significant and therefore provides useful additional prognostic information [40, 69]. Array CGH profiles of more than 1,000 tumors are now available and open the way to more in-depth meta-analysis of the genomic profile of NB, especially enabling the search for more infrequent but important genomic changes. As NB is a tumor with a remarkably heterogeneous clinical course, one of the main challenges is an accurate outcome prediction, enabling a better choice of risk-related therapy. As differences in outcome are considered to reflect underlying genetic and biological characteristics that affect mRNA gene expression profiles, several genome-wide mRNA expression profiling studies have been undertaken to establish a gene-expression-based classifier for improved outcome prediction in patients with NB [74–78]. Berwanger and colleagues  reported that expression of the FYN gene predicts long-term survival independently of MYCN amplification. Moreover, the authors could show that expression of active FYN kinase induces differentiation and growth arrest of NB cells in culture. Recently, a 42-gene expression signature was established using an innovative data-mining approach using expression profiles of four published microarray studies (De Preter K, personal communication; permission was obtained; De Preter K is co-author on this review) and an extensive review of literature on individual genes with prognostic value. This classifier was validated in silico on three independent and unpublished datasets. The gene set was extended by re-analysis of three further published microarray studies and by an extensive literature screening for single candidate prognostic genes, yielding a list of 59 potential prognostic genes in total. By measuring gene expression using quantitative reverse transcriptase PCR, this set of 59 genes was profiled in 579 patients, the largest NB patient series so far . This showed that the signature was a strong independent risk predictor and could identify patients with increased risk in the current risk groups, that is, patients in the current high risk group, who were being treated with high dose chemotherapy, and patients in the low risk group, who were usually treated by surgery . So far, most gene expression profiling studies have focused on the identification of prognostic signatures. However, careful scrutiny of the prognostic gene list and functional analyses might reveal genes that have a role in NB pathogenesis and, therefore, could serve as potential therapeutic targets or point at pathways involved in cancer that could be targeted by new therapies. Furthermore, inclusion of transcriptome information on the cells of origin of NB (sympathetic nervous system progenitors) can add additional power to mining of tumor gene expression data. Indeed, transcriptome profiling of fetal neuroblasts and comparison with tumor data highlighted a series of interesting candidate genes and pathways that were assumed to be involved in NB pathogenesis (such as ALK, KIF1B and CADM1) . In a more recent analysis, gene lists obtained through mining of neuroblast and NB gene expression profiles were used in conjunction with the Connectivity Map tool , which allows prediction of therapeutic compounds that could be of use for the cells under study . Future studies will certainly be directed towards further integrated analysis of mRNA, microRNA (miRNA) and gene copy number profiling, in order to obtain further insights into the complex molecular pathways that govern pathogenesis of the different subtypes of NB. In cancer cells, aberrant tumor suppressor gene silencing can occur as a result of alterations in methylation patterns. Over the past years, several abnormally methylated genes have been described in NB. These genes encode proteins that are involved in various cellular pathways, including apoptosis (the protease CASP8 and the adaptor TMS1), the cell cycle (the cyclin-dependent kinase inhibitor CDKN2A, the cyclin CCND2 and stratifin (SFN)), differentiation (the retinoic acid receptor RARB2), and invasion and metastasis (the cadherin CDH1) . Some significant associations of epigenetic signatures with clinical and biological parameters have been found [85–89]. Besides single gene associations, Alaminos et al. demonstrated that clustering of neuroblastic tumor samples by the methylation pattern of ten genes allowed the identification of several clinically relevant groups of tumors. Global methylation studies have demonstrated that a methylator phenotype, characterized by the methylation of multiple CpG islands, is a hallmark of NBs with poor prognosis . Recently, the presence of methylation markers in serum of NB patients has been described as an indicator of prognosis and therapy efficacy [90, 91]. These findings have demonstrated the clinical relevance of promoter hypermethylation in the pathogenesis of NB. Global profiling of gene promoter hypermethylation to identify genome-wide aberrantly methylated genes is therefore warranted in order to further understand NB pathogenesis and to identify new prognostic methylation markers for the optimization of therapeutic strategies. During the past decade, small non-coding RNAs have emerged as a new and unexpected piece in the complex puzzle of the transcriptome. One set of non-coding RNAs, the miRNAs, has been studied heavily in the context of cancer. These tiny molecules are 22 to 25 nucleotides in length and function as negative regulators of gene expression. Their expression correlates to prognosis, diagnosis and response to treatment and, like coding genes, they can function as oncogenes or tumor suppressors . A key role for miRNAs in NB is also becoming apparent. Chen and Stallings  were the first to show that different prognostic subgroups of NBs are characterized by specific miRNA expression profiles . One of the major factors driving this differential expression is MYCN amplification. Interestingly, the majority of these miRNAs are down-regulated in the MYCN-amplified tumor samples. These findings are in line with the reported global downregulation of miRNA expression in poorly differentiated cells [85, 94]. 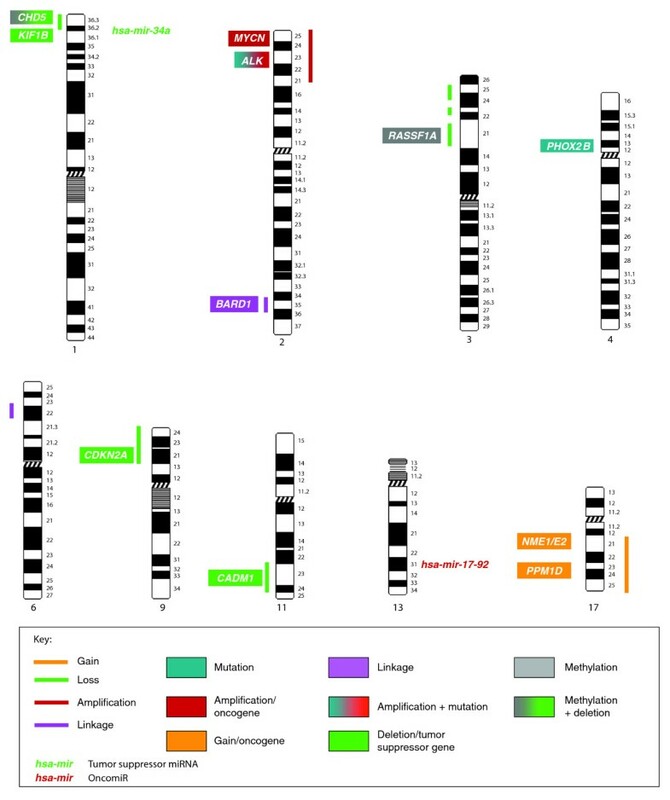 miRNAs that are activated by MYCN belong to the three paralogous clusters miR-17-92 (a cluster of seven miRNAs), miR-106a and miR-106b [95, 96]. These clusters show a high level of sequence similarity to each other and are derived from a single gene that underwent a series of duplications, mutations and deletions during evolution. Overexpression of the miR-17-92 cluster has been reported in several cancer types and is responsible for boosting cell cycle progression and blocking apoptotic signaling (Figure 1) [97–99]. In NB, we and others have shown that miR-17-92 expression is directly activated by MYCN through a direct binding to conserved E-box elements in the miR-17-92 promoter  (Mestdagh P, personal communication; permission was obtained; Mestdagh P is co-author on this review). This results in a strong increase in tumorigenesis both in vitro and in vivo by downmodulation of p21, a negative modulator of the cell cycle, and BIM, a pro-apoptotic gene . Treatment with antagomir-17 (an engineered miRNA inhibitor) restores expression of p21 and BIM and abolishes the growth of MYCN-amplified and therapy-resistant NBs in vivo, indicating that targeted miR-17-92 inhibition might be useful in the treatment of NB. MYCN itself is also a target of miRNA molecules: miR-34a, a key effector of the p53-mediated apoptotic response, directly targets MYCN, thereby suppressing MYCN protein expression [101, 102]. Interestingly, miR-34a is located within the minimally deleted region on chromosome 1p36 and shows a decreased expression in NBs with a 1p36 deletion (Figure 1) . Given the frequent association between MYCN amplification and 1p36 deletion, loss of miR-34a expression might be essential in maintaining high MYCN protein levels in tumor cells. Indeed, exogenous miR-34a overexpression results in decreased NB cell growth through increased apoptosis and decreased DNA synthesis [101, 102]. It is becoming clear that miRNAs have a central role in the pathogenesis of NB, but further research is warranted in order to get more profound insight into the complex regulatory interplay between coding and non-coding genes. Although we are only beginning to understand the role of miRNAs, new small and long non-coding RNAs are being discovered that may prove to be other missing pieces in the cancer puzzle. About half of all children with NB are classified as high-risk patients, for whom conventional treatment options achieve a disappointingly low overall survival rate of less than 40% . It is therefore imperative to translate the increasing knowledge of NB biology into development of novel, targeted therapeutic approaches. We will focus here on three key oncogenes (MYCN, MDM2 and ALK) that are excellent targets for molecular intervention in NB. A detailed overview of other promising preclinical investigations and ongoing clinical trials for treatment of high-risk NB can be found elsewhere . The MYCN transcription factor has attracted considerable interest as a potential drug target in view of its frequent amplification and oncogenic role in aggressive NB tumors and its very restricted pattern of expression in normal postnatal cells. These efforts have not yet resulted in a mainstream anticancer therapy, which may in part be explained by difficulties associated with selective pharmacological inhibition of nuclear transcription factors , but various strategies aimed at counteracting MYCN activity are actively being pursued. First, several potential small-molecule inhibitors of MYCN transcriptional function have been identified using a cell-based MYCN reporter gene assay . Similarly, a screen for small molecules that are synthetically lethal with MYC overexpression has identified various compounds interfering with the MYC pathway at different levels, termed MYRAs (MYC pathway response agents), which have subsequently been shown to also selectively target the MYCN pathway [108, 109]. A second group of MYCN-targeting interventions aims at inhibition of MYCN expression by the use of nucleic-acid-based therapeutics, such as antisense oligonucleotides [110, 111] and RNA interference techniques [112, 113]. Another appealing approach for molecular therapy of NB is provided by a crucial protein-protein interaction that regulates, to a great extent, the cellular decision between life and death: the physical association between the p53 tumor suppressor protein and its major negative regulator MDM2. Escape from the p53-orchestrated failsafe program is a necessary event for tumorigenesis and is achieved by mutational inactivation of the TP53 gene in approximately half of all human neoplasms. However, NB tumors only rarely present with a TP53 mutation at diagnosis and often rely on an inappropriately increased activity of MDM2 to keep p53 in check [25, 114–121]. Consequently, targeted disruption of the p53-MDM2 interaction may be a powerful means of unleashing the potent antitumor capacities of wild-type p53 in NB cells, without inflicting the collateral genotoxic damage associated with conventional chemo-therapeutic drugs. Using a low-molecular-weight compound that competes with p53 for binding into a hydrophobic cleft on the surface of MDM2, termed nutlin-3 , we have been able to elicit a robust and selective activation of the p53 pathway in NB cells with wild-type p53, leading to G1 cell cycle arrest, apoptosis, premature senescence and neuronal differentiation . MDM2 inhibition by nutlin-3 also dramatically sensitizes NB cells to chemotherapy-induced apoptotic cell death , and nutlin-3 can reverse P-glycoprotein-mediated multidrug resistance of NB cells regardless of TP53 mutation status . These findings suggest that nutlin-3 may hold promise as a new treatment option for NB. A recent breakthrough in our understanding of the pathogenesis of NB is the identification of activating point mutations in the tyrosine kinase domain of the ALK gene as the main cause of familial NB, and implication of these mutations in a substantial fraction of sporadic NB tumors [59–63]. Furthermore, the ALK locus is also a recurrent target of copy number gain or amplification in sporadic NB [59–63, 126]. The remarkable success of small-molecule tyrosine kinase inhibitors in other tumor entities, such as imatinib in chronic myeloid leukemia and gefitinib in non-small-cell lung cancer, illustrates the vast therapeutic potential buried in targeted inhibition of oncogenically activated tyrosine kinases . NB cells harboring ALK mutation or amplification have been shown to have an absolute requirement for ALK signaling [59–63, 128]. Thus, it is expected that selective ALK inhibitors, which are a major focus of current drug development efforts , may prove valuable for the treatment of selected NB patients. NB is a clinically and genetically heterogeneous disease, with a very variable clinical course and outcome. An essential step towards better understanding of this enigmatic disease is to gain more insights into the (epi)genetic defects and deregulated signaling pathways leading to NB onco-genesis. Genome-wide analyses have enabled researchers to identify recurrent amplifications, gains and losses of genomic regions, allowing further delineation of the genetic heterogeneity of this tumor. At the single gene level, an increasing number of genes and loci have now been identified that are implicated in NB. After many years of NB research, this complex disease now seems to be finally unmasking its disturbed genetic profile, which hopefully soon will allow the development of more efficient and less toxic molecular therapies. The authors' work is funded by the Belgian Foundation Against Cancer, the Children Cancer Fund Ghent, the Belgian Kid's Fund and the Foundation Nuovo-Soldati (JV), the Fund for Scientific Research Flanders (KDP, TVM), the Foundation Fournier Majoie pour l'Innovation, the European Union under FP6, and the Belgian program of Interuniversity Poles of Attraction. All authors were involved in the drafting of the manuscript, and each contributed to a particular section.